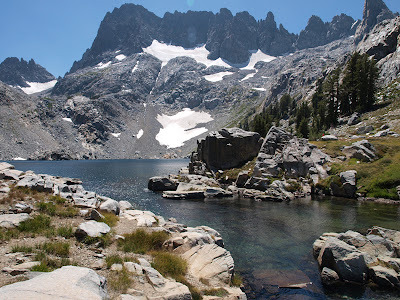 2013 Sierra Packtrip, Part III: Getting down to work. 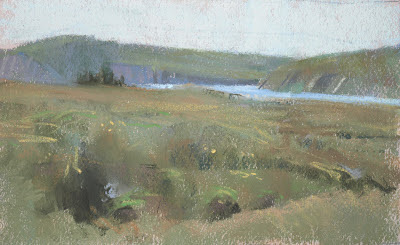 After hiking to Iceberg and the Nydiver lakes the first 2 days, I was ready to move less and paint more. 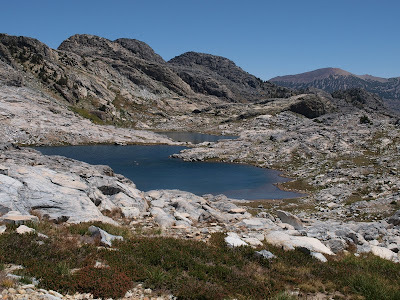 Accordingly, after doing a morning painting in camp, and having another tasty breakfast from Kelly, our stellar cook, I shouldered up my pack and walked a very short distance over to one of the creeks that runs down from the upper reaches of the basin into Ediza. There were numerous small pools and waterfalls of varying size to choose from as I wandered along the banks. 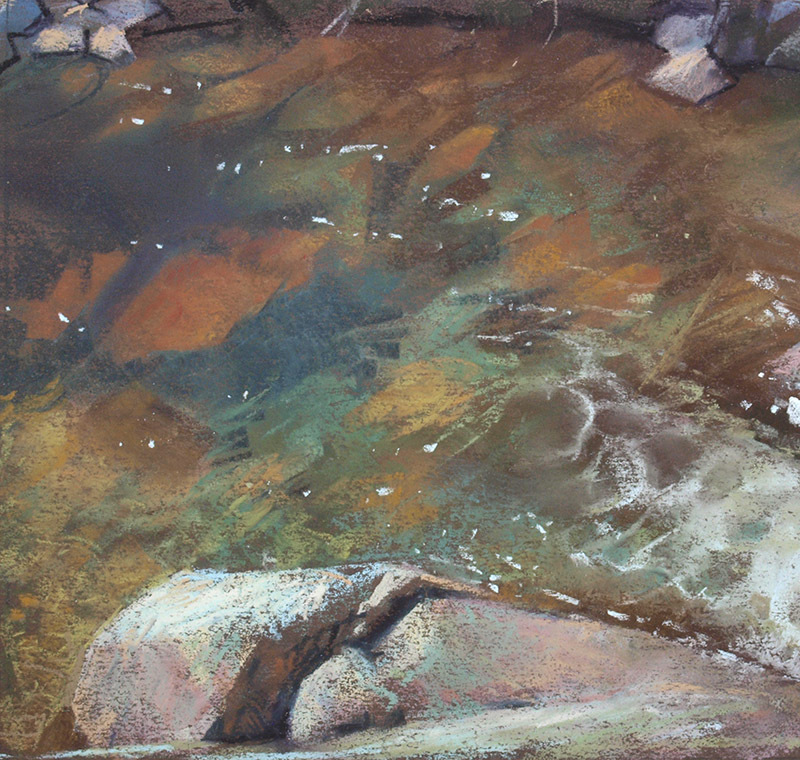 I found one pool that had enough depth to show the shift in water color, as well as having some whitewater, and a nice reddish, submerged boulder. The spot was surrounded by a thicket of trees, so I could work in the shade for quite some time. Just what I was looking for. This was a fun piece, though it didn't start to fully work until I put in the white water moving across the surface to give it a better perspective context. 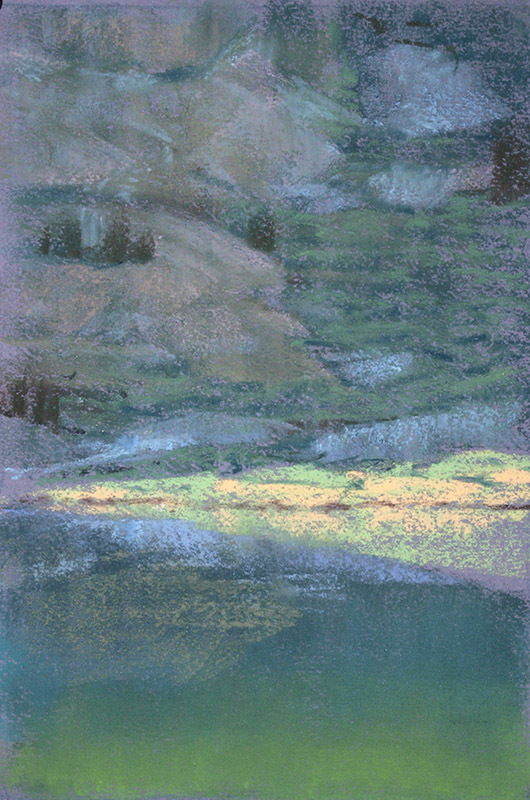 The water was rough enough that the rocks at the bottom were broken up and distorted in the deeper areas, so I had to generally depict them in fragments of the right color. There's an excellent oil by Sargent that I saw at a retrospective in Seattle over 10 years ago. It is about a 6 foot long painting, depicting a ship at a stone breakwater. 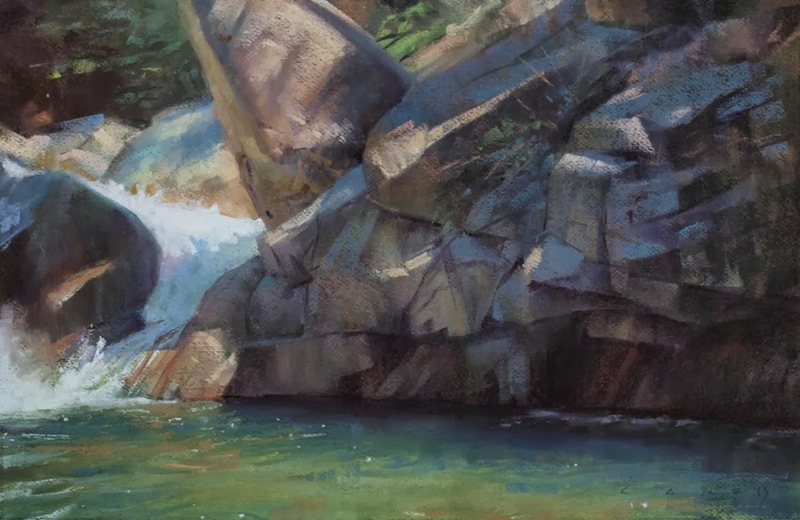 When I was working on this piece, I started thinking about how Sargent had thrown down such loose and colorful paint to make a convincing depiction of underwater rocks. I took a lunch break, sat down in the shade, nibbling on my usual fare of peanuts, dried apricots, an apple, and a stash of chocolate chip cookies. Then I poked around a bit, and walked down to talk to Julia Lundman, who I spotted working further down the creek. After chatting, I still couldn't figure out what to paint, and decided to head back towards camp, and maybe go for a (30 second) swim. On the way there I stopped and decided the view of the trail, and the lake through the trees below might work, so went at it. It still needs some work in the foreground. Ernesto, Paul, and Eric had gone by while I was working on this. 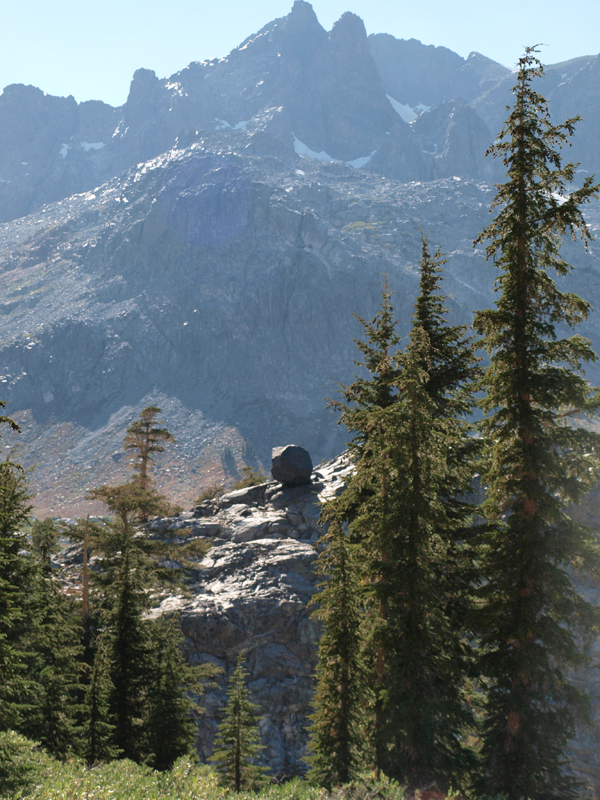 I finished up, turned around and spied this view between the trees with the boulders in the mid-ground. Hmmm.... I was getting pretty tired of standing at this point, but re-positioned, and went back to work. By now it was late afternoon. I finally finished up and walked over to where Eric and Paul were painting. They were both aiming towards the afternoon light with varying views of the upper reaches of the basin. There was plenty of atmosphere and great shapes to play with. I checked my watch: 4:30, and resolved to come back tomorrow (Thursday) and work from that spot. Thursday. This was the last full day before we had to hike out. I got up before 6, and saw Ernesto headed for his sunrise painting spot he'd been going to all week. 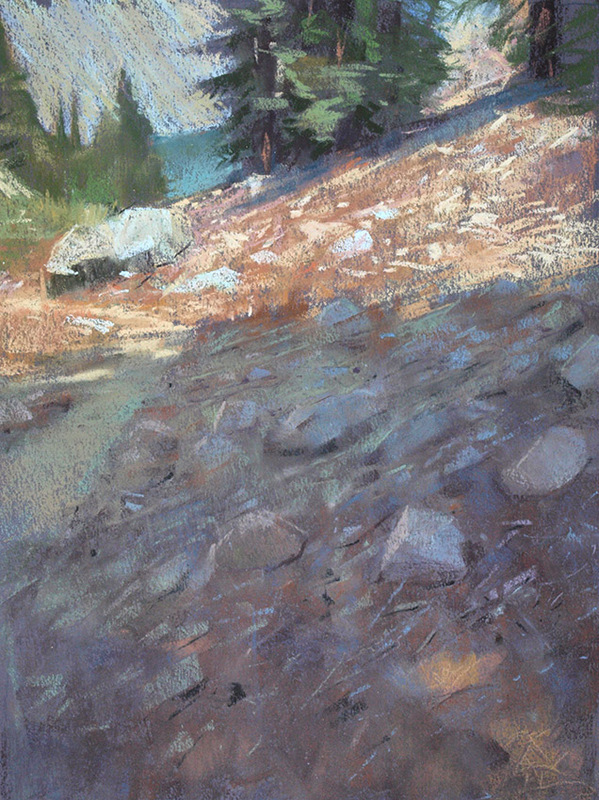 I headed the other way around the lake, and painted a view looking towards camp from across the lake, which is the last image in my Part I post. I wrapped up pretty quick, and hurried back to camp just in time to get some breakfast (essential), then cleaned up, and headed out again to get the most out of the last day. Back to the creek I painted the day before, but I instead became interested in some sinuous granite forms running up a hill, in orange and green grass, interrupted by foreground trees, with a hint of a deeper, and higher background... Once again the brightest lights on the rocks were decidedly cool in nature, which I attempted to depict. This was the view I had spotted a day earlier. My eye was drawn to the light and shadow break in the distance, plus the steep, curving slopes running down from the upper right. I was pretty much out of energy and time at this point, but set up near Eric Merrell, who was continuing work on a piece he'd started the day before. I did a small study, that I may work into a larger piece in the studio. 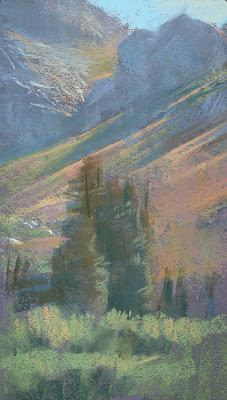 The light changed rapidly on this one, as cast shadows came down the slopes from above. That was it for me. 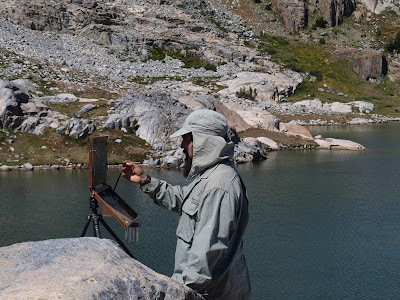 I packed up and walked back to camp to clean up and hoist a beverage with the other artists that had been camped together in this great spot all week, wandering around the basin, and painting to their heart's content. 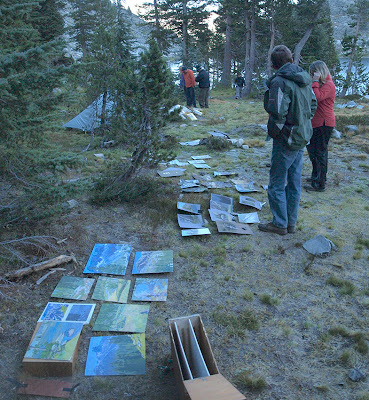 Before it got too dark, everyone went and laid out their work, so we could all see what the others had been up to. Its a part of the trip that I truly value and enjoy, as one gets to see the world one has been studying intently all week, through someone else's eyes, and can draw inspiration and insight from the shared, multiple points of view. The impromptu art show had us wandering around the camp looking at groups of work laid on the ground for our perusal. Nothing left to do but dig into a steak dinner, with sautéed veggies from Kelly's garden on the side. Another great week in the wilderness drawing to a close as dusk settled in. But wait, there's more. 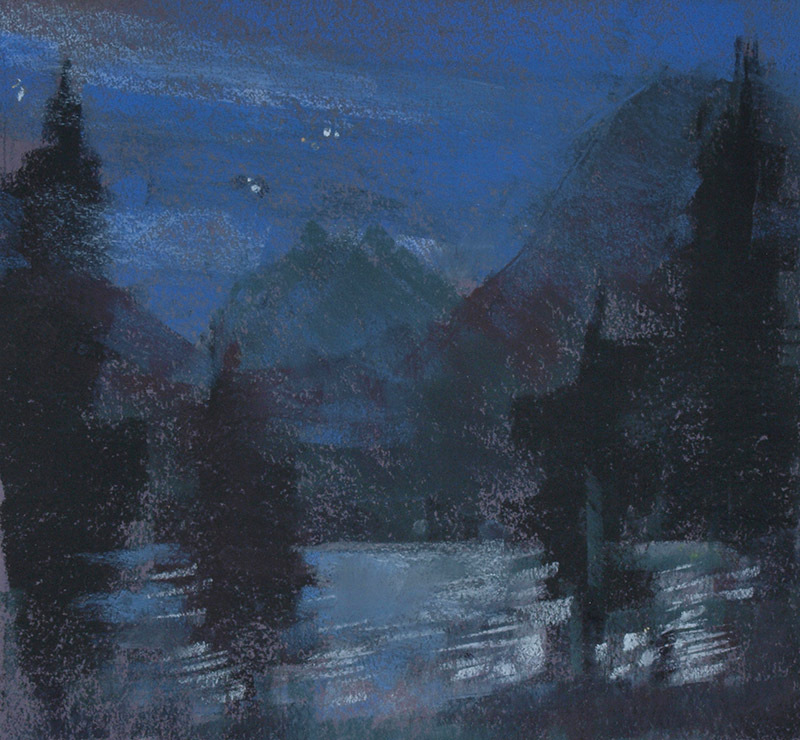 "Professor" Eric Merrell had been painting nocturnes in camp for several nights with his own unique laboratory setup of gooseneck LED's, dutifully taped with a color correction gel and a diffusing filter (wax paper), augmented by the light of a waxing moon. It seemed a daunting task, primarily because the undisciplined flock of well-lubricated painters who stayed up to watch him work, wandering about and yakking, were likely a distraction more than anything else. But perhaps we unwittingly functioned as a DEW system for the bears. Eric offered to let me use one of his LED's, so I took him up on the offer, and gave it a shot.... a very quick shot. For the astro inclined, that's part of the tail of Scorpius floating above the Minarets. One thing I immediately learned is that any strong light on your work, under such low light, will kill your vision for the subject you're trying to see. Kind of like the paradox in quantum mechanics...(the act of observing/measuring, effects the outcome of the event) yeah, just like that! I love science. 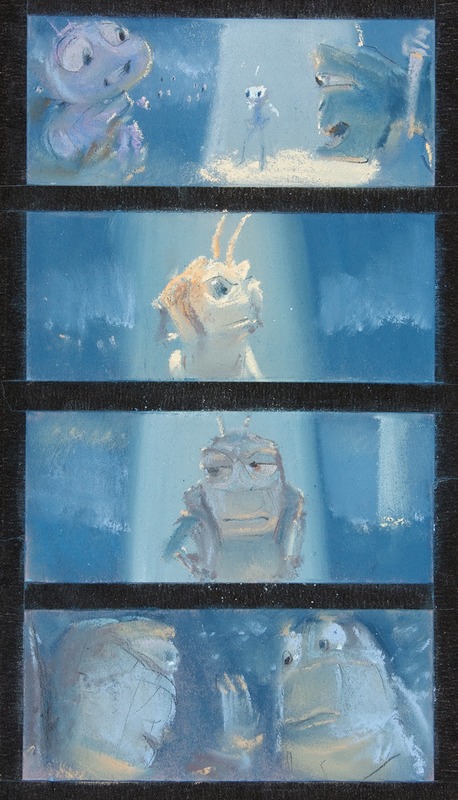 Regardless, I could see value differences in the scene, and the low level of the light on the colors in my box only allowed me to see them as values. 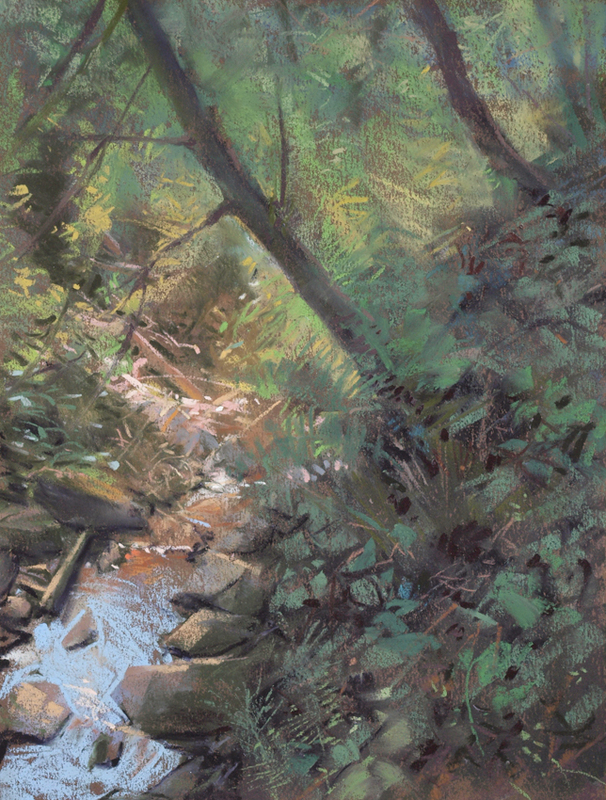 I had a general idea of where my hues were, and so, just grabbed values with some bias towards hue selection. I hammered away, then spent a little time trying to see deeper, or adjusting some shapes. Much later, at my tent, I was looking at the stars for awhile, and in the absence of white light, I could get a subtler sense of what color was visible in the scene. I think you could augment observation in the dark, with written impressions, memory, as well as direct effort with the aid of low light, and perhaps get a deeper, more personal color sense going. Or, you could just borrow Remington's nocturnal palette, or someone else's, and paint it in the studio. It is an interesting problem, and I give Eric credit for pushing the perceptual envelope, and setting such an inspiring example for the rest of us sleepy heads. That wraps it up for this year's summer adventures. I'm already looking forward to the next one. My deep gratitude to the artists and friends who came on the trip this year, as well as Kelly, our cook, and her son, Cole. It was the collective spirit and good will that made it such a good one. 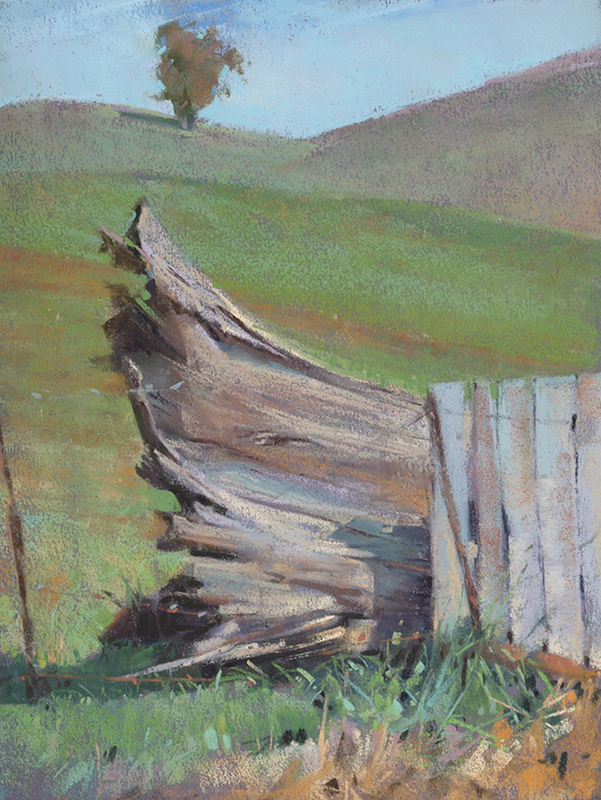 Meanwhile I'll be in this years Sonoma Plein Air event, barring any unforeseen complications. 2 other upcoming events are my one man show at the Studio Gallery in October, with the reception on the 6th. And, lastly, I'll be teaching one more weekend workshop this year at the Lifeboat Station in Pt. Reyes. 2013 Sierra Painting Packtrip, Part II: Sightseeing! Approaching the lake, which is just beyond the meadow. Ernesto, late in the afternoon, after painting all day in the meadow. 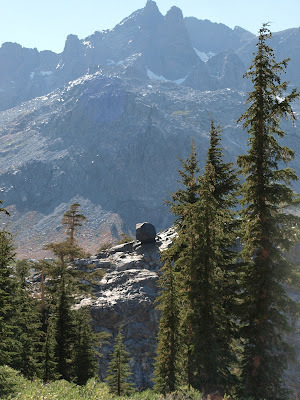 Here's a huge erratic we spotted on the way down. The atmosphere was pretty heavy, probably from the Aspen Fire to the south. 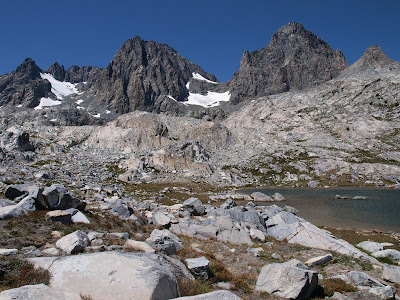 The curved basin below Ritter and Banner, across the valley, was to be our route on Tuesday, to get to the Nydiver Lakes. 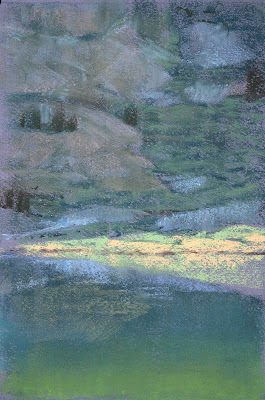 I did 2 pieces that day, and here is one of them below, a fairly typical, (and un-retouched) view of the shoreline. For some, it may seem ironic that, surrounded by such alpine vistas, I have a habit of picking these more intimate scenes. I simply find such closeup views to be equally beautiful, and often unique to such an environment. I wouldn't see these colors and forms in the Bay Area, any more than I would see the jagged peaks. I never get tired of the color relationships found in wet and dry rocks, as well as the clarity and depth of water, and the hue shifts to be found there. I should point out that the light at that altitude, after sunrise, cools considerably. Much more so than at lower altitudes. The warmth seen on the rocks at the top of the image was local color, while the average rock temperature, and the temp of the sunlight, combined to make a cool result in the brightest areas. It is a somewhat disconcerting effect, as it doesn't match our everyday perceptions in the lowlands. I may have to 'adjust' this one. It may mean adhering to the overcast 'rule' (cool light, warm shadows) for example. On Tuesday, after doing our morning paintings, having breakfast, and filling up our water bottles, we decided to hike to the Nydiver Lakes. We decided not to go for a shortcut on the way up, and opted for a clear trail up to the basin below Ritter and Banner. 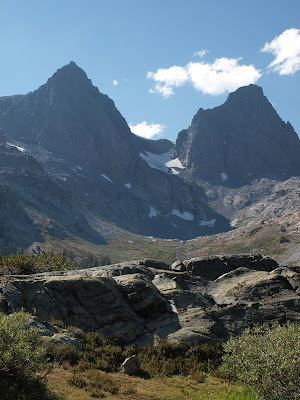 From there, we headed east, up a rocky slope, expecting to see the lakes at the top. Instead, we just found a landscape littered with shattered boulders. We had to walk another quarter mile before they came into view below us. Our view of the lakes below us. We found 3 medium sized lakes, a couple of pond-sized ones, as well as dried up pools. Looking back towards the peaks. We had climbed over the mid-ground ridge on the left from the basin. I modified my setup for painting up there due to strong gusts of wind. I sat on the ground, clipped my umbrella to the tripod, and weighted it down with rocks in my bag, hanging from the center post. Water? Check!, Hand Lotion? Check!, Cookies? Check! Go! Ernesto did not have an umbrella, so oriented his easel to be in shade. 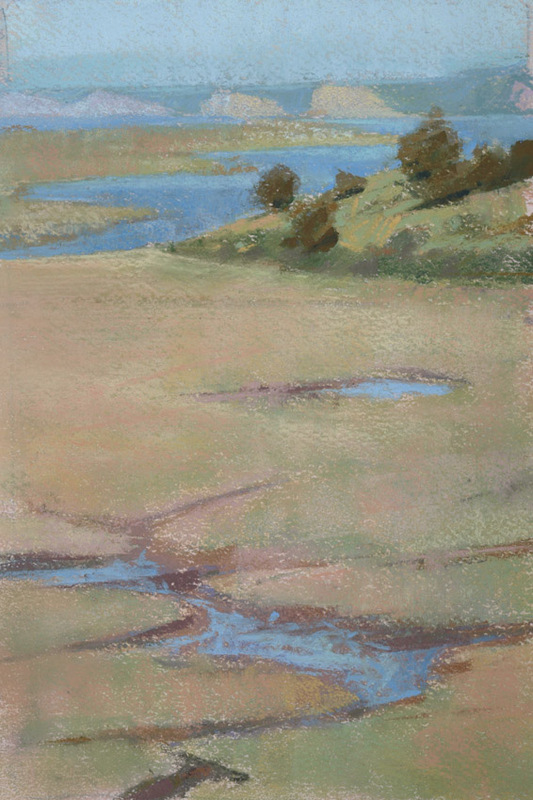 He was painting the meadow and shoreline to the upper right. This is a quick study I did from my spot, later in the afternoon. I was compelled to paint this view, partially because it resembled Edgar Payne's penchant for inserting lakes that didn't exist beneath lofty alpine crags. Here it was the truth. 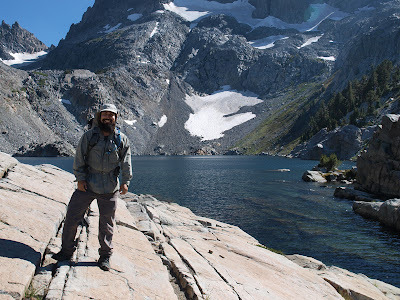 We didn't want to go back the way we came, as we knew were right above our campsite, so we ditched our packs and walked over to the edge of the plateau we were on to see how steep the descent would be. 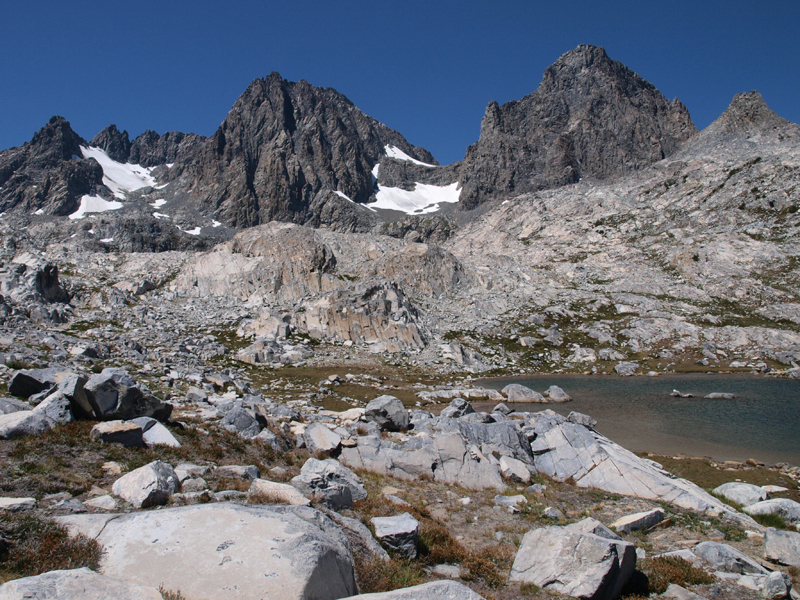 It resembled a double black diamond ski run, with boulders and weeds instead of snow. The lake in this image is Ediza. On the lower right shore of the lake is a white dot. 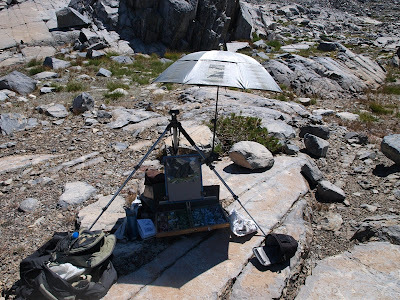 That is Eric Merrell's umbrella, with him beneath it, painting. If you look to the top of the image, you can see Iceberg Lake, to which we'd hiked and painted the day before. 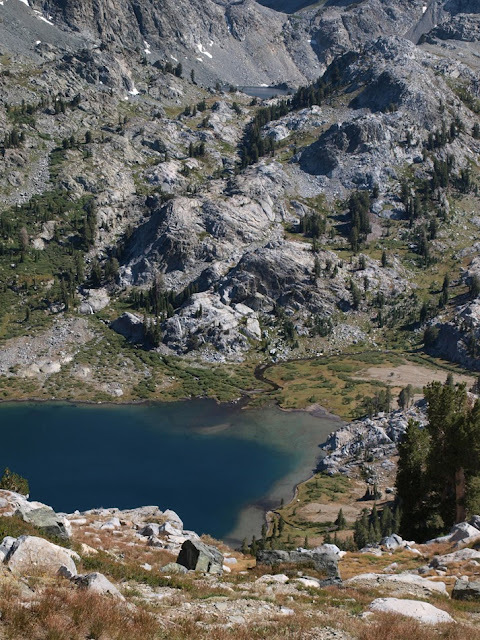 You may also note that we are looking down on Iceberg Lake. We decided it was do-able, went and got our packs, and spent about 45 minutes ungracefully and gingerly picking our way down the slope. That was enough climbing and exploring for me. I was determined to stay out of the sun for the next few days, and paint 'locally'. Besides being sore and tired, I was in the mood to spend more time painting, and less time walking around out of breath. It was time to get to work. A fine group of artists and friends, of which I was fortunate to be a part of, spent 6 days camped on the shores of Lake Ediza in the Ansel Adams wilderness last week. 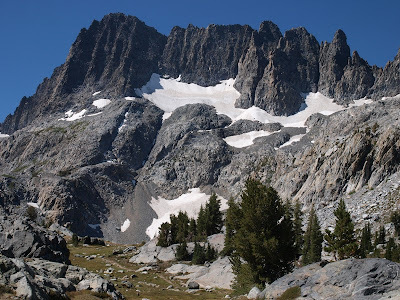 This was accomplished with the help of Red's Meadow Pack Station, who supplied us with mules to carry our gear up, and a cook to keep us well fed, between sleep and our daily expeditions to paint whatever we could between sunrise and sunset. Even that limitation was somewhat exceeded by those who were up before sunrise to paint the alpenglow on the peaks, or the moonlit nocturnes that were painted well after dinner, spearheaded by Eric Merrell. My companions on this year's journey were: Paul Kratter, Ernesto Nemesio, Michelle DeBraganca, Jeff Horn, Julia Lundman, Eric Merrell, and Sergio Lopez. I encourage anyone interested to check out their websites, blogs, and other social media to see what they've done from the trip. I may re-write this post over the next few days as it evolves. What follows is not necessarily chronological, but primarily paintings and photos with notes and recollections, in a few categories, and as it is getting late, I believe it will be in multiple posts. Virtually everyone did some painting before, during, or right after sunrise, at least a few times during the week. It helped of course to have hot coffee and fresh melon slices laid out by our amazing back country cook, Kelly, prior to beginning our labors, or if we were in sight of the kitchen, to have her come by our easels with a slice of sizzling bacon or sausage as a snack before breakfast. "How do you want those 2 hen bullets? Medium? Over Easy?" We were camped on the northern shore of the lake. 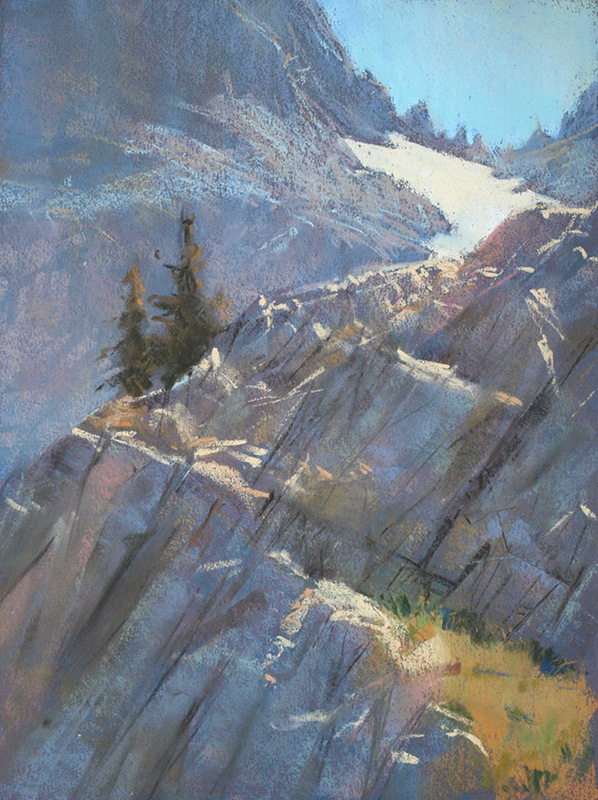 The image above was painted in the morning from camp, looking roughly southeast to the right of the rising sun, and I'm looking past illuminated air into the shadows of what is called 'Volcanic Ridge' on the maps, a greenish, glacially scarred, steep range that runs a few miles from the San Joaquin headwaters up to the Sierra crest. The Aspen Fire, about 20 miles south of our area had a pronounced atmospheric effect, most noticeably on a few afternoons, but when I could see atmosphere like this in the morning, I had to wonder if the effects of the fire were also coloring the morning haze. 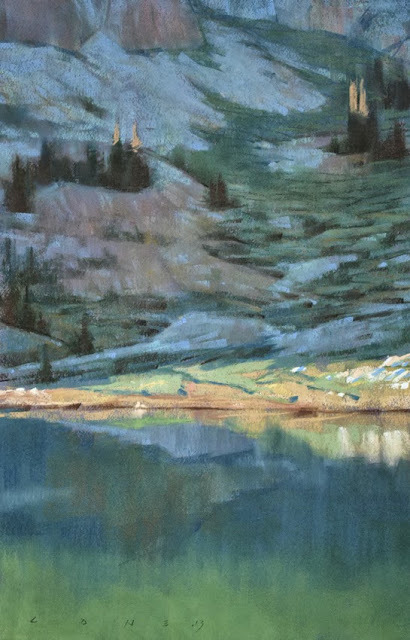 Here's another study painted from camp, looking roughly south across the lake, as a sliver of light began to invade the shadow. The color range in the water has to do with a change in depth in the foreground. This one is a candidate for a larger studio piece. 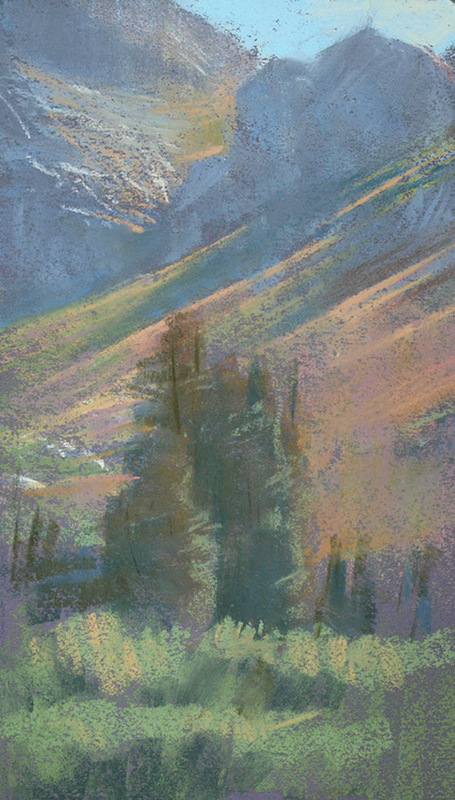 This might be a post breakfast piece from camp, but you can see the range of color that was common at least to looking towards the lake in a southerly direction in the morning. After painting morning views from camp most of the week, (it is hard to resist sausage delivered to your easel), I tried walking halfway around the lake and looking towards our camp, and was amazed at the range of color shift to be had. I got up around a quarter to six to get over there. 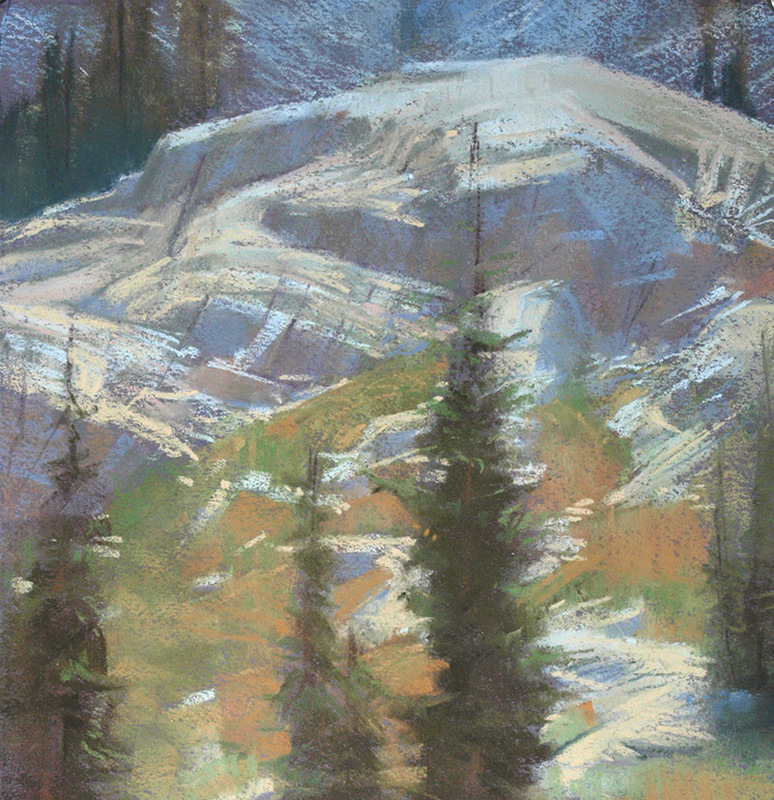 Ernesto and Sergio were up at that hour for several days straight to hike to their own spots to paint before sunrise. 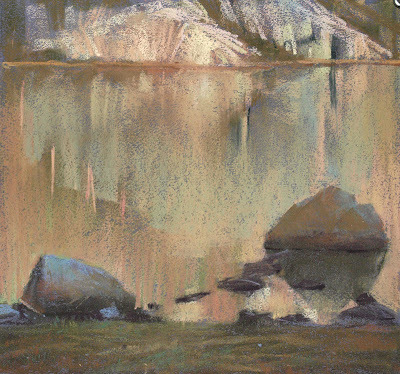 I had my eye on a huge boulder by the lake, but by the time I hiked over there and did a pencil study of it, I began looking at these smaller groups of rocks nearby against the reflected colors in the water, from the trees and granite bluff on the opposite shore. While I was working on this, I could spy my cohorts across the lake, sipping coffee and conversing... probably eating bacon as well. I taught a 2 day workshop out at Pt. Reyes a few weekends ago. We had sunny skies, but a fair amount of wind, which did have impact our activities, but not our spirit. 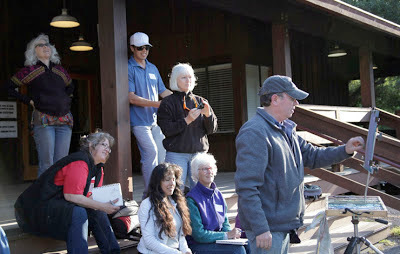 It was a great group and a wonderful location, which I hope to continue exploring over the seasons and years. As the class convened on a Friday evening at the Clem Miller Center out at Limantour, I drove up in the early afternoon to scout a few spots, and get warmed up. I drove straight to the beach, and hiked out on the spit about a half mile towards Drake's Estero, realizing eventually that I would never drag everyone out this far unless there was something unique about the view. One justification for it is that the further one walks from the parking lot, the less likely others have painted those views. Disregarding the point of view, the light, color, and forms of the world were not appreciably different, so there was no reason to ask people to walk that far. The wind was blowing pretty strong, so I set up facing into the wind, and painted 2 views from the same spot, exploring the textured masses of foliage and grass, trees making sharp silhouettes into the glare of the afternoon sky, and the cooler colors of distant cliffs in relative contrast to the mid-ground. It was very bright out there, so I tried a coral covered paper, as opposed to my usual default color of twilight. 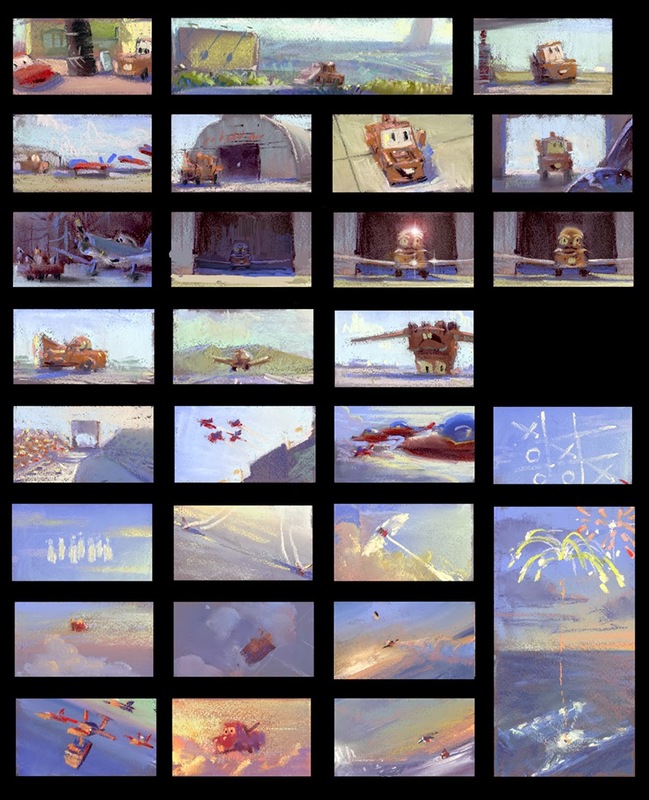 I'm currently of the mind that picking an overall value key, as opposed to merely a "non-conflicting" color like twilight is worth trying, especially when dealing with very bright or dark situations. 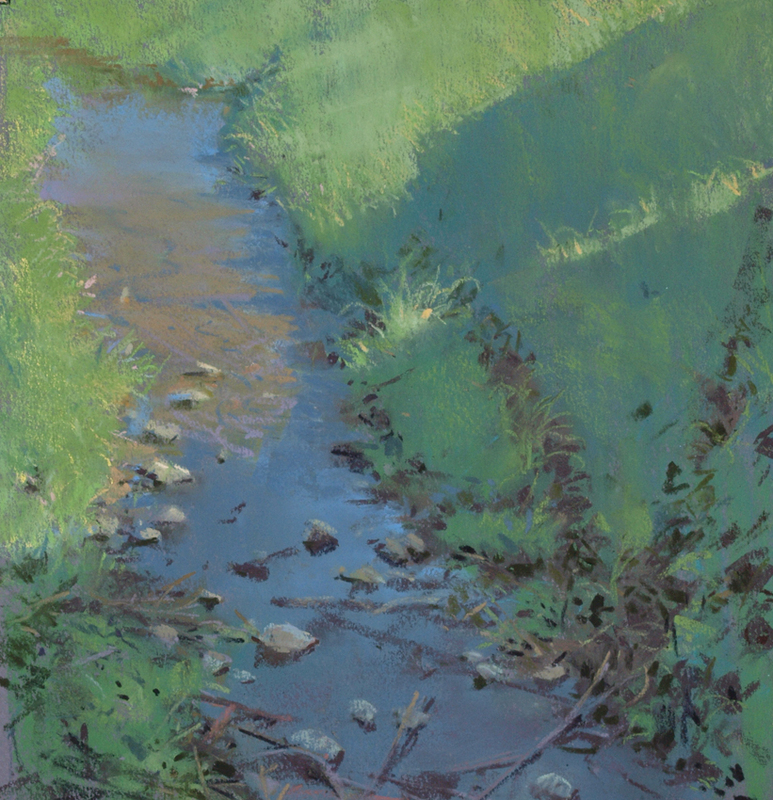 2 artists I've seen that use a similar ground are Lorenzo Chavez (pastels) and Jennifer McChristian (Oils). Jennifer's pink ground tends to be a lot more saturated than Lorenzo's. The wind was blowing pretty steady the entire time, and it was getting around 5, so I packed up, hiked back to the car, and drove to the facility, which is located just past the youth hostel at the end of the road. Several folks were already pulled up and unpacking, so I did the same. 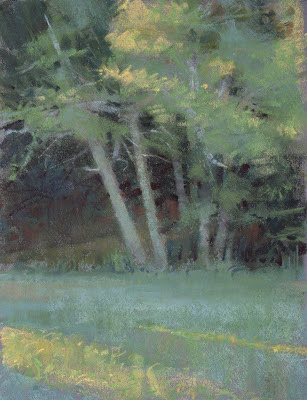 As the days are long, and the light was good, I set up in front of the conference center to do a demo of some trees across the meadow. 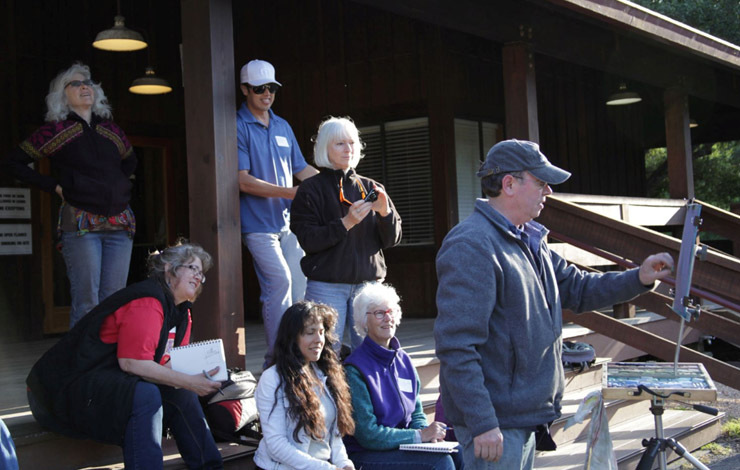 There were a lot of repeat folks from my previous workshop, so it was a pretty jovial and talkative group right off. A relaxing way to start a class. 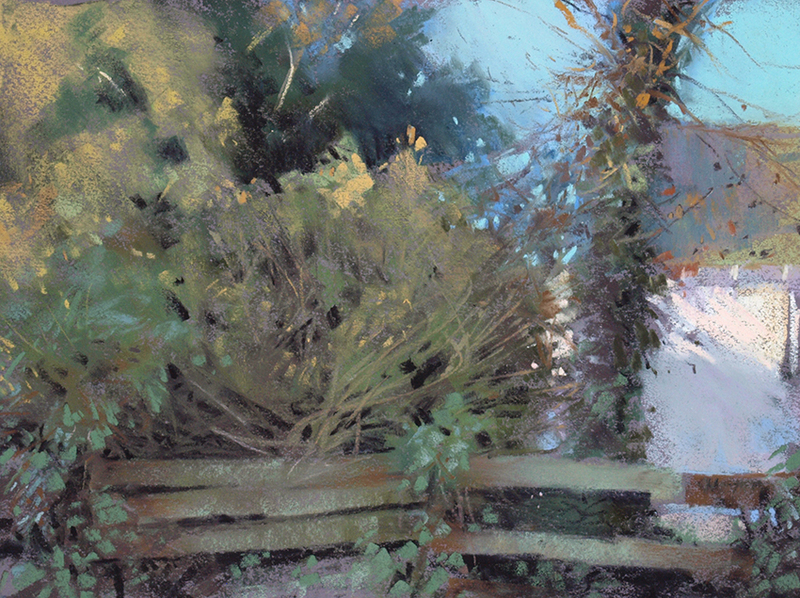 Here's the Friday evening demo, with a fair amount of clean up in the studio. 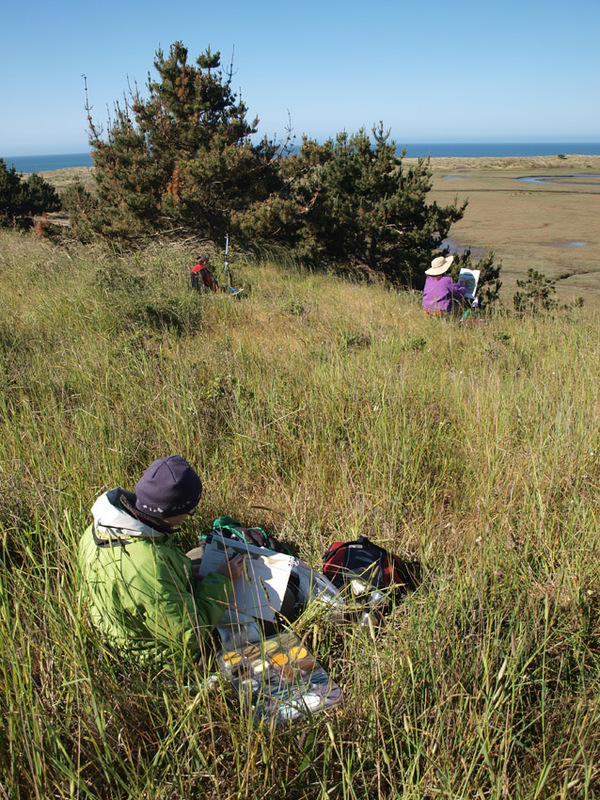 We got out of camp pretty early on Saturday morning and headed down to Limantour. There was a light haze, most evident when looking towards the sun, so I did my next demo of that, just going for the ragged, graphic silhouettes and the morning glare in the sky. Folks set up all along the path leading to the beach, and for several hours we had very few people come by. The ever rising wind drove us back to camp around noon. After lunch, everyone put up their work in the conference center, and we had a critique. 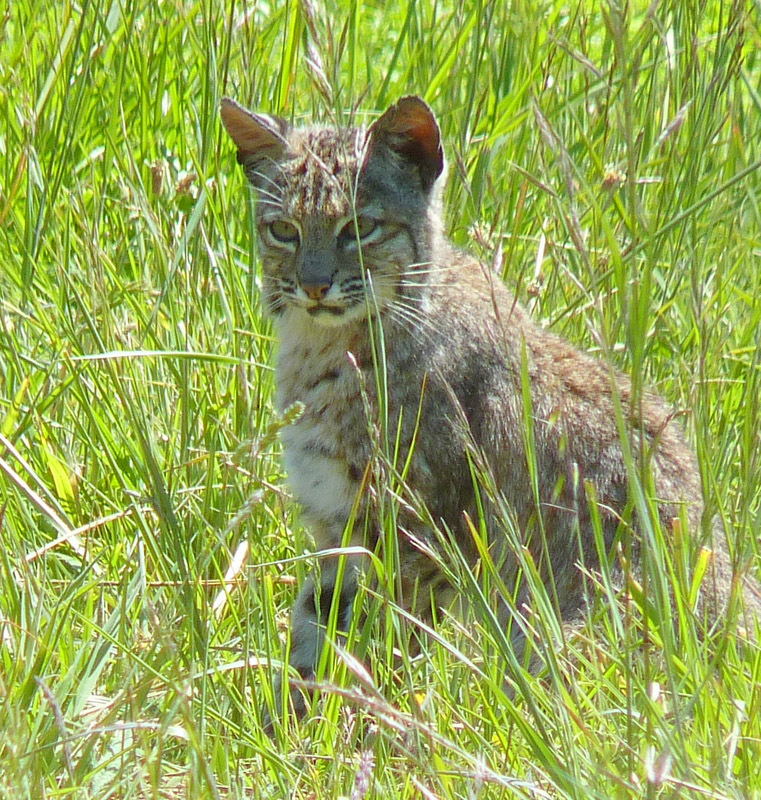 During that discussion, I was upstaged by a bobcat that was hunting rodents in the meadow behind all the students. 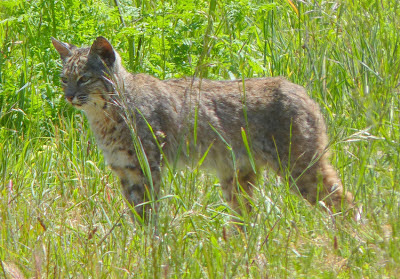 One mention of the bobcat, and the critique was abandoned for the next 20 minutes as we watched it twice stalk and pounce, only to come up empty handed. 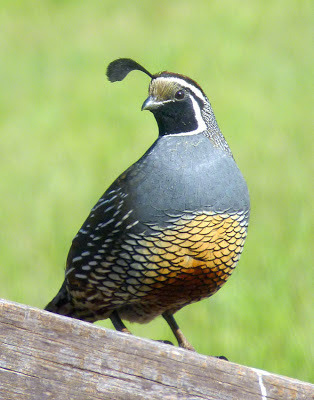 There was also an abundance of quail, a covey, a plethora... If you left a building they would come running out from beneath it and scurry ahead of you, seemingly in a panic, then suddenly veer out of your path into some shrubbery, like a car unexpectedly driving off a cliff. The specimen below was strutting on a railing outside the window. Yet another distraction from our serious work. As it was still windy, everyone spent the rest of the afternoon painting in camp. We had a great feast of a potluck that evening and then called it a day. 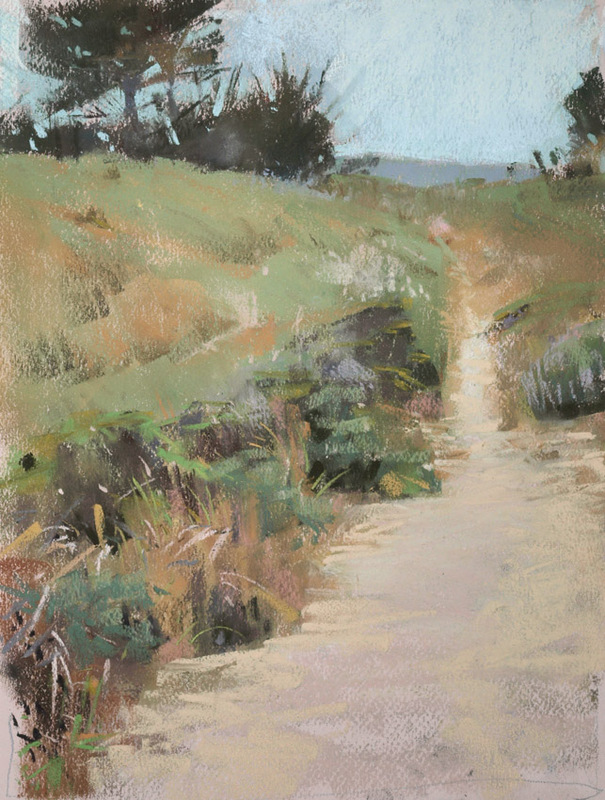 Sunday morning, we were back at it, this time painting from the bluff off the parking lot, and looking away from the sun. The flatness of the light was redeemed a bit by some atmosphere, as well as the iconic graphic forms of the estero and the cliffs. A lot of perspective in this sort of view. There were some interesting interpretations of this view, some choosing to focus on the serpentine channels in marsh below us, and others looking way out to the chalky cliffs towards Drakes Estero. I worked on my demo for awhile, then abandoned it to do walkarounds. Most of my demos feel a bit unfinished, and this one was no different, as I leave them alone to go do walkarounds. I did some clean up work on it back in the studio. We made it back to camp for lunch, a final crit, and then it was time to cleanup and say our goodbyes. 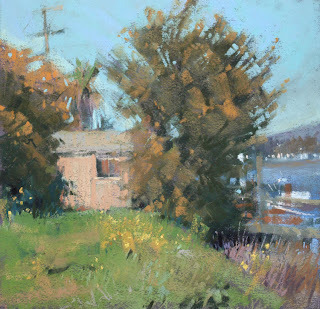 I hope to be doing another workshop in the park in October, out at the Lifeboat Station, which is way out by Chimney Rock. I'll post specifics when I know them. Thanks to everyone for taking the class. It was a great group, and for Regina and Grace for providing assistance. 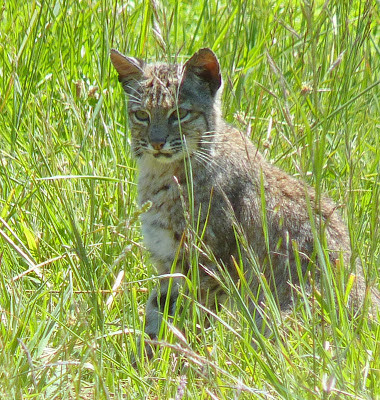 Quail and bobcat photos by Janet Theilen, and the group shot is by Grace Bourke, I believe. Days are getting longer and the weather is getting warmer around here. Summer is knocking at the door. 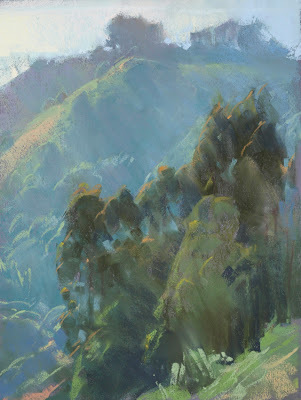 I painted in the Berkeley Hills on Friday afternoon in front of a film crew from work for an instructional video to tempt people away from their keyboards. This scene must be familiar to anyone who's gone through a body of my work, as I've painted here many times over the last 17 years. In addition, I've dragged probably a hundred colleagues up here to paint with me. Though the shapes are familiar, I always enjoy trying to get the color and light of that specific period. In the afternoon, the sun drops lower and lower, unifying all bg colors and knocking out details, as the glare and haze of the light intensifies. I know the light is always changing, and after 17 years, I've changed as well, so the challenges and pleasures of this sort of scene are renewed. Its always a good workout. Things I contemplate messing with in the studio are the yellow bald spot on the ridge in the upper left, and the edges of the tree silhouettes on top. 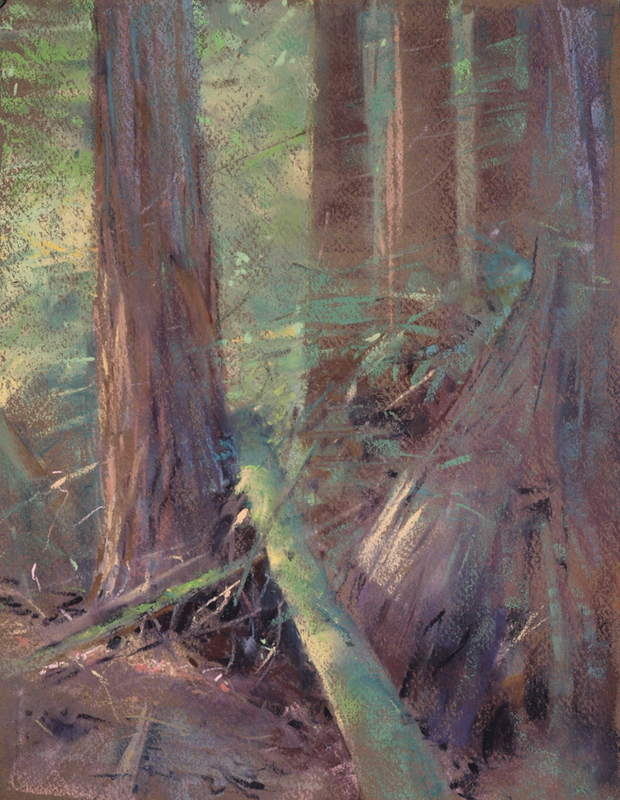 Painted on Saturday down in Canyon, a second growth Redwood and Bay Laurel forest in a ravine, with a trickling creek running through it. I've ridden bikes through there for years, and enjoy coming here to paint, especially when it gets warm out. The temperature in the forest is usually 10 -15° cooler than it is in town. I am intrigued by these types of scenes, and am still trying to get a better handle on controlling them. I tried to stick to a basic pattern of of light and dark, but there's some ambiguous transition areas, and perhaps both tree trunks are too parallel. Overcoming the 'facts' of what lies in front of me in nature is an ongoing challenge. What to leave out, what to modify, avoiding too much detail, figuring out how to 'move the eye', all the while the light is sliding on and off the very objects one is trying to paint. The studio can be an 'ER' of sorts to examine and correct these concerns. This one will need it. Sunday mid-morning, back in Canyon, contemplating Redwoods, and their accompanying debris field. The light glides across twigs, branches, trunks, and leaves at an alarming rate that I'm resigned to. 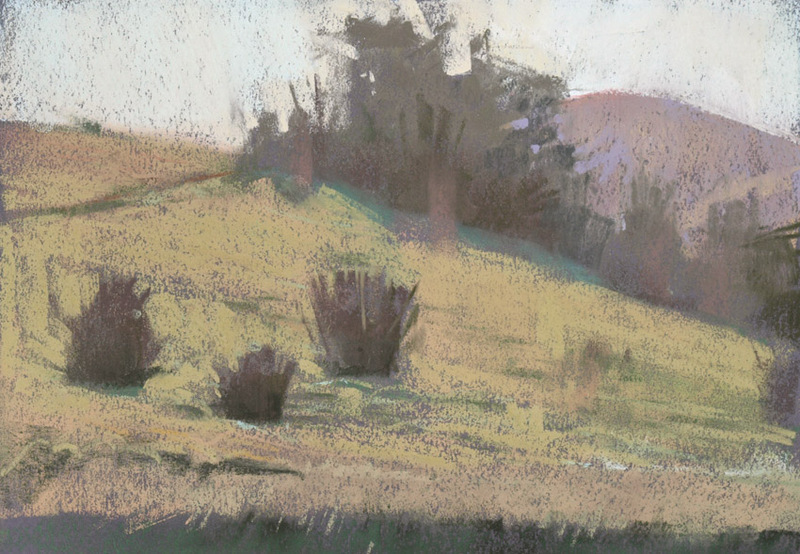 I used my pencil sketch as a map to where the light and shadow patterns were in the foreground, because they were gone in about 20 minutes, sometimes partially returning to taunt me into changing my patterns. We can't keep up. 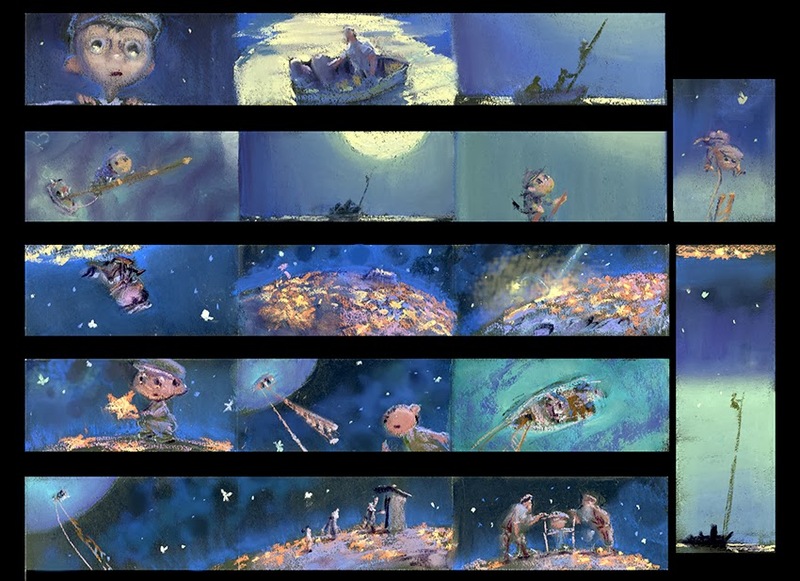 I think there's some amazing things down here to paint, and I'm just trying to decode it right now. Not even sure of the light level yet, as it could be a lot darker, but I get fascinated by the 'shadows within shadows' as I find those patterns to be of interest. Actually, those patterns are shadow masses that are interrupted by twigs and branches, breaking them into a series of mosaic-like shapes. I think of them as shadows trapped in a web of twigs. The trees are a rich, dark, violet red, but a blue green ambient light bathes them from above and around, and sometimes a warm bounce off the ground creates an almost incandescent effect that reminds of me of light in the Grand Canyon. A warm bounce light hitting a warm colored object in shadow is a treat for the eyes. Are any of these ideas clearly expressed in my painting? Merely hinted at. More research is needed! 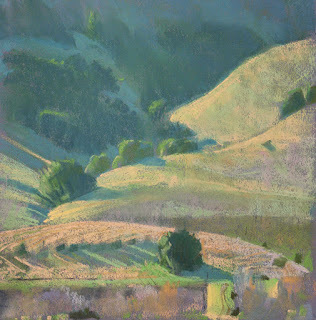 I attended a California Art Club event a few weekends ago up in Sonoma. We all converged on 'Old Lakeville Rd. #3', a dogleg section of old road off the Lakeville highway, which slopes west towards the Petaluma River. This section of the road encompasses grapevines, cattle, sheep, and miniature horses, which may be the Llama and/or Chinchilla of their time. Whatever they are, they are cute. I drove up early with Paul Kratter, and we drove the length of the road, looking for where we might begin our day. Following that 'revealing' excursion, we picked a hilly section, lined by eucalyptus, which also had a creek running under the road, that had been trampled by cattle. The shadow, crossing over grass and water, the edges of the grass, and the modulation of color in the water, added up to something I felt worth spending time on, so off to work I went. As I painted, more and more artists, and a few local residents, came driving slowly by. The locals to wave, or warn us not to get run over, and the artists to say 'howdy'. In short order, some of my other Sierra pals, Kim Lordier, and Clark Mitchell cruised by. 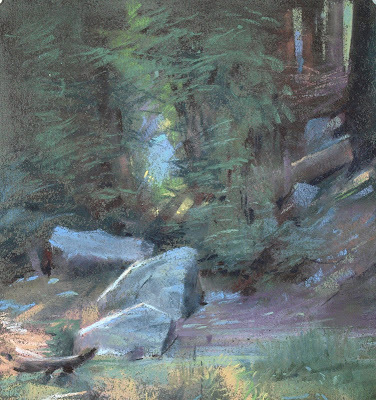 Richard Lindenberg, and Christin Coy, whom I painted with in Sequoia National Park, were out and about, as were many other familiar faces. Part of the fun of an event like that is running into so many folks you know, on a rather remote rural road, and meeting new ones as well. It was a gorgeous day for being outside in the spring. 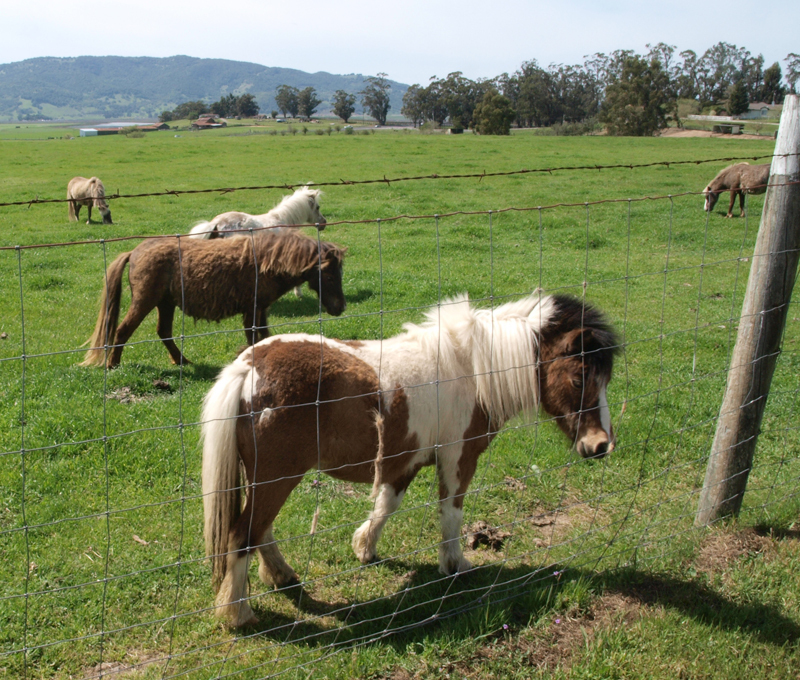 Green... but with atmosphere, plenty of shade, eucalyptus, to take refuge in the reds and violets, plus miniature horses. You couldn't go wrong, unless of course you were downwind from too many cattle up the hill. It is funny how idyllic views in nature may actually 'stink' in real life. Similar to that are scenes painted from the side of a freeway, that look utterly peaceful, but whose true context is quite noisy and somewhat dangerous. This was a peaceful spot, though quite overrun by artists, who probably outnumbered the local population of that stretch of road. 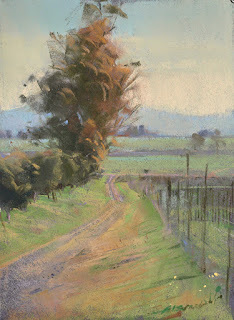 I wandered up the road from my easel to pick a second spot, and found a eucalyptus view a little ways away. 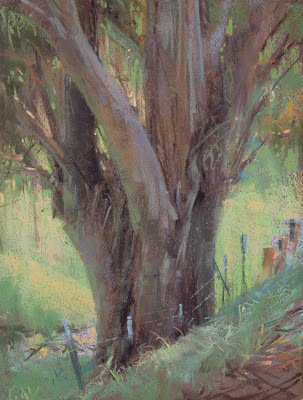 I liked the figurative strength of the tree, the contrasting values and colors beyond it, as well as how reflected light bounced onto the forms of the branches. That one came together fairly quick. After a lunch break at a taco truck on the other side of town, we drove back and went after some afternoon atmospheric views. Though I thoroughly enjoyed painting after lunch, as well as bickering with my colleagues, my results weren't so enjoyable, so all I'm posting are the two morning pieces. Both these pieces are in the show that Paul and I are having at Walt Wines in Sonoma. The show is up now, and the reception will be on the 21st of April, from 2-5. You can view more of the work from the show here. Hope to see some of you at the reception. 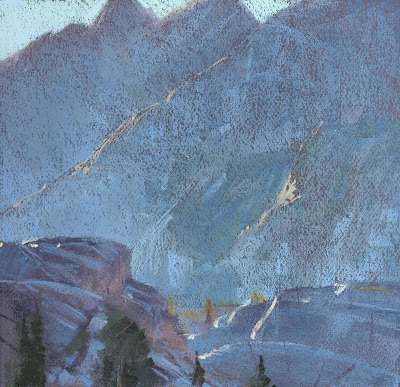 I've been having painting adventures with Paul Kratter for almost 10 years. Many is the time at Sonoma Plein Air where we've occupied the opposite side of a display wall in the plaza on a Saturday to show our work, after spending a week of painting all day, meeting up for dinner, hanging out in a guest house, listening to good music, and talking about art. Since 2005, we've been on packtrips to the Sierra every summer, spending time painting in some exotic alpine locale. Disregarding the scenery, its basically Sonoma at 10,000'. 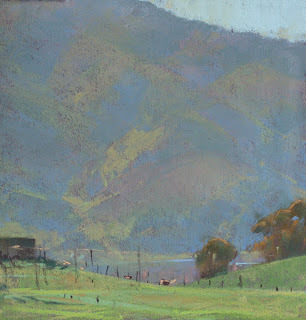 Years ago, we held a joint exhibit at the Orinda Library, and this April, we'll be having a small 2 man show at the Walt Wines tasting room in Sonoma, just off the plaza. We each have our own visual predilections... I tease Paul about his penchant for barns and certain species of trees, and he gives me equal grief for painting ditches and random shrubbery. Regardless, we manage to get along, push each other to do better.... and periodically to step outside our own comfort zone. Periodically. I've been trying to get up to Sonoma on the weekends to build up some inventory for this show. Paul and I even managed to paint together a few weeks ago. Not surprisingly, in the same spot I could find a ditch, and he could find a barn. Here's a few recent paintings with notes. Later that day on Bonneau Road, reverting to one of my 'fascinations'... The obligatory ditch is below the frame, as the fence, foliage, and the side of the house on the right were what caught my eye. Painted Sunday (2/24).Thats not a barn on the left... just a wall of some sort. Mid afternoon, looking west on Old Lakeville Road. 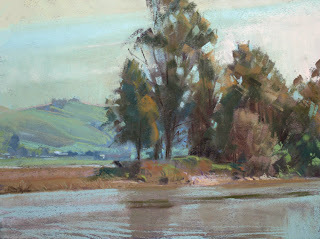 The Petaluma River is that blue streak running through the Eucalyptus. 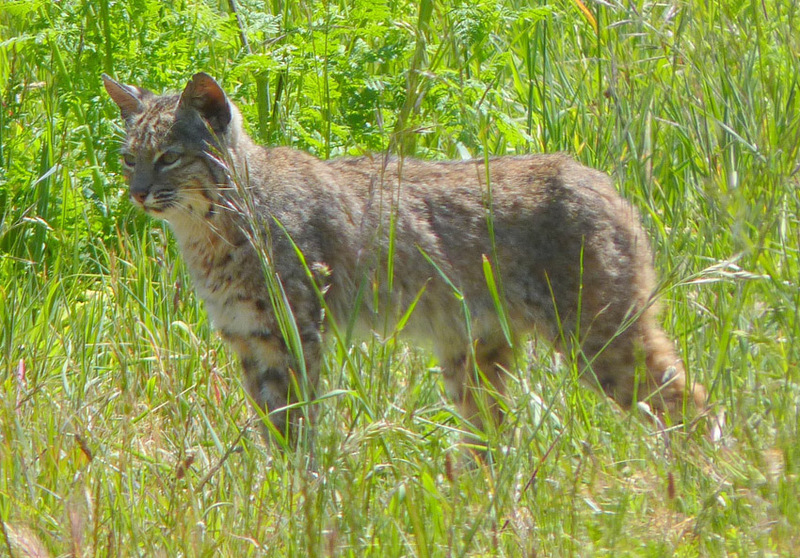 Mid-morning, a few weeks ago, pulled off the highway on the way into town. An idyllic view, but cars were whizzing by right behind me. The grass went from yellow to green, to blue green, as the eye moved towards the horizon. 2 Pheasants were fighting with each other in a hedge off to my left. Something about this made me give it a shot. We'll see... More to come!